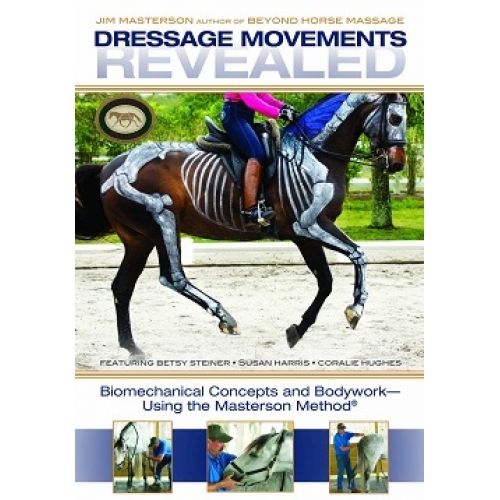 Jim Masterson the creator of the Masterson Method brings you a new instructional 2 Set DVD that addresses the unique expectations and demands put on the horse’s physiology as he moves up through the different levels and movements of dressage. Here you discover what goes on with the horse’s body during dressage training, enabling riders and trainers to recognize when a horse may be developing physiological issues. Specific Masterson Method bodywork techniques are shared to help riders meet the unique demands on the dressage horse. A horse painted with a skeleton and muscles by renowned author and artist Susan Harris (creator of the first “painted horse” Anatomy in Motion DVDs released in 2005), performs upper level dressage movements that exhibit extension, collection, bending, and lateral movement. Dressage rider and trainer Betsy Steiner helps demonstrate how it feels when muscle tension or lost range of motion make it difficult for an otherwise trained horse to perform the movements required of upper level dressage performers. Format: DVD - Region Free 2 DVDs run time 175 mins.